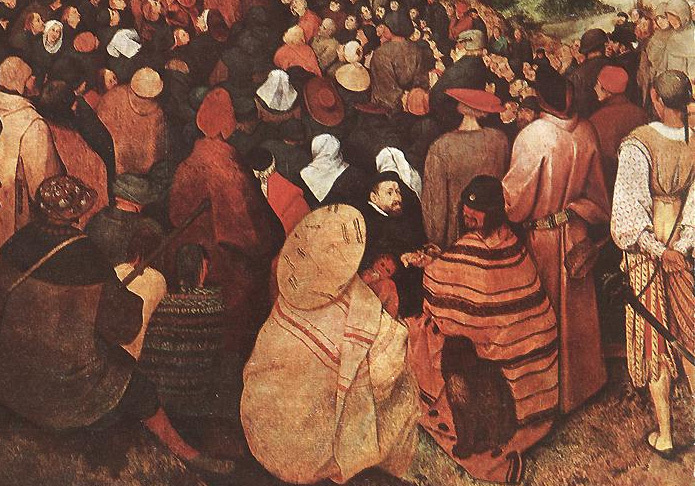 Pieter Bruegel was about forty years old when the Duke of Alba entered Brussels. The painter was married, and had a son. His reputation as an artist was not as widespread across Europe as that of the recently deceased Michelangelo, nor again as that of Titian, by whom every prince sought to have his portrait painted. 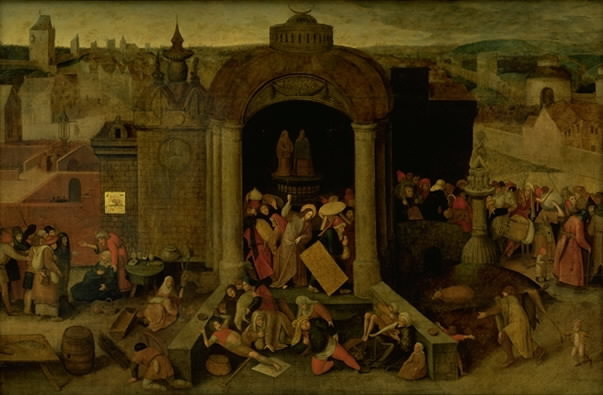 Many knew of Bruegel, however, and his works had a recognized cash value in his immediate home area, as can be deduced from the inclusion of sixteen Bruegels in the list of possessions which a Netherlands merchant gave as surety. Bruegel was living in Brussels when Alba led his army into the city in August 1567. 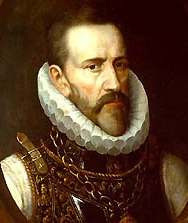 The Duke had been sent by Philip II, the Spanish king, to whose empire the Netherlands provinces belonged. The commander's orders were to forcibly convert the Protestants; during the years that followed, he would have several thousand Netherlanders sentenced to death. This extreme harshness resulted first in an uprising, and then in a war which was to last eighty years, ending with the division of the land into Catholic Belgium (as it would later become known) in the south and Protestant Holland in the north. King Philip of Spain was a staunch Catholic: "I would rather sacrifice the lives of 100,000 people than let up in my persecution of the heretics. "He regarded Catholicism as the state religion; accordingly, heretics also constituted a political threat. In 1566, Netherlands Protestants - in particular Calvinists - had destroyed the religious images in Catholic churches, using spears and axes to pull statues of saints from their pedestals and tear altar paintings to pieces. For them, worshipping material images was nothing less than idolatry. What the Calvinists regarded as a struggle for the true faith amounted to rebellion in Philip's eyes, and he therefore despatched Alba as his commander, a man known - indeed, notorious - for his ruthlessness. 1567, the year in which he entered Brussels, would bring the great turning-point in the history of the Netherlands provinces; and Bruegel was to witness the events from close to. We possess no clear written indications as to whether the painter supported the Protestant or the Catholic side in this struggle. Nor is it readily apparent what message his pictures convey: we must search for hints. In the year of the "breaking of the images", Bruegel painted The Sermon of St. John the Baptist (1566), of whom the Bible tells us that he had announced the appearance of Christ on earth. 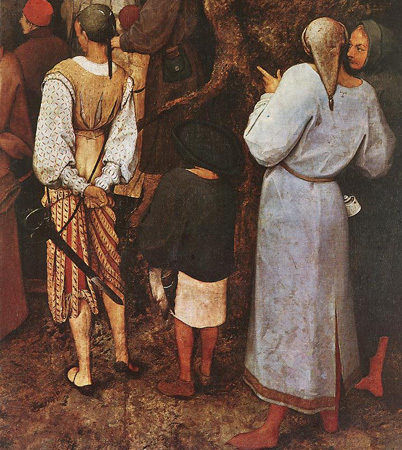 Bruegel has portrayed St. John preaching in the woods. 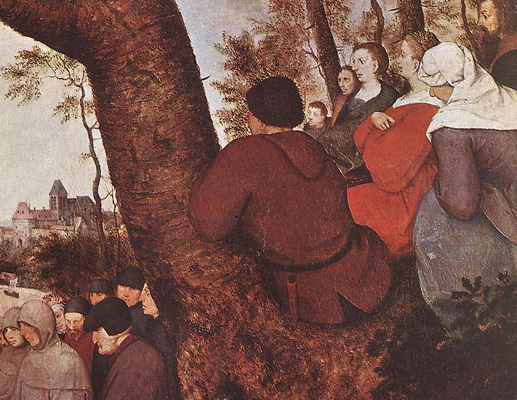 We can make out a river, mountains, and a church in the background; some of the many listeners in the foreground are clad in striped garments, characterizing them as coming from the Middle East - yet the scenery and the clothing of the other figures point to a setting in the Netherlands of Bruegel's day. It was nothing unusual at that time to place biblical events in a contemporary setting, in the painter's own surroundings; occasionally, however, religious motifs were also given political topicality. Such is the case here: non-Catholics were compelled to practise their religion in secret gatherings as long as the authorities forbade them freedom of religion. This particularly affected the socially radical sect of the Anabaptists. Like St. John, who had baptized the adult Christ, they too practised adult baptism, meeting in the open air. A critical contemporary wrote of one such meeting in the woods: "... it was primarily the common folk one saw there, people with an immoral way of life... to be honest, however, one also came across people there who enjoyed good reputations and led blameless lives. One would never have believed that such people would go to these sermons. "Bruegel, too, has painted not only the "common folk". The bearded listener at the right-hand edge of the picture resembles the artist himself - a furtive self-portrait? At any rate, he has left a memorial in the form of this picture to the secret religious meetings and their sermons. 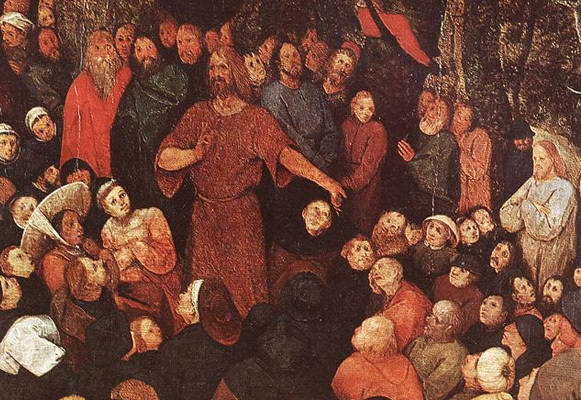 Protestant preachers roamed the Netherlands, propagating their new teachings in the open air. The same was true of the Anabaptists, who based their religious teachings on those of St John the Baptist. 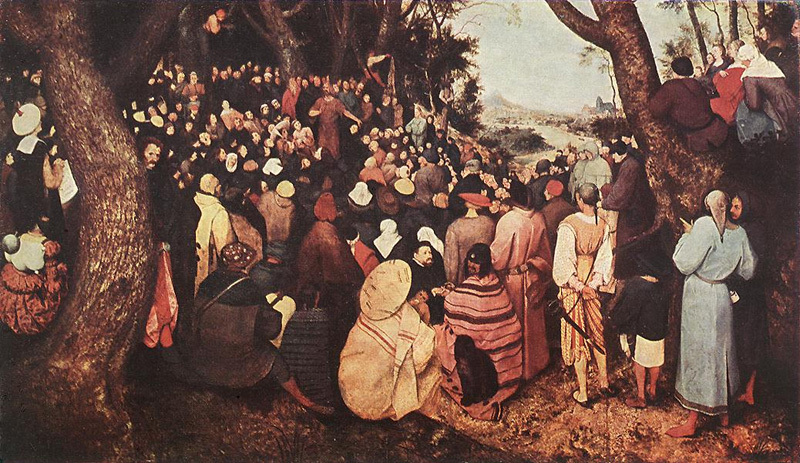 In depicting a contemporary gathering, Bruegel has put the biblical John the Baptist in the place of the preacher. His left arm is indicating Jesus, who clearly stands out among the crowd through his lightcoloured garment. Unlike such painters as Albrecht Durer. 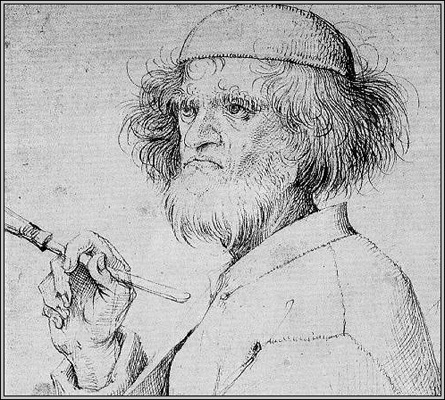 Pieter Bruegel produced no self-portraits, being disinclined to glorify his own person. Occasionally, however, one may find a bearded figure occupying an unassuming position at the edge of a picture, a figure who might possibly be the painter himself.